Keyword research could be considered as a fundamental of online advertising, content marketing, or all other things related to the digital world. If you are going to find something on Google or any other searches you must have to add some keywords. So, if you are working on SEO techniques and avoiding the research of keywords it means you avoiding the significant thing of SEO. If you have chosen the wrong keyword for your organization or might the keyword is not related to the product you are offering and you are having good traffic to your product or website but all in vain. Because you are not getting the potential or related traffic and getting all unqualified traffic for your website. It could be a great cause of user’s frustration too and they might click the back button or leave your website now there is “bounce” rate for your website. So the important and main purpose of SEO “attain right traffic for your website” can’t be achieved. If you are ignoring your local search, it means you are ignoring the important audience for your website. Google has updated its algorithm on 24 July 2014, named as pigeon for the better display related to the services of your neighborhood. In the new services tool “My Business” is to place the right data or information related to your business. So, if you are thinking to hit the audience at the global level but ignoring your local audience this is not a smart business decision. First, you should optimize your business at the local level in the local market ranking and boost your business among your local audience and step forward to the global. Meta Description has magical importance in the SEO. A well-written almost 160 characters of the Meta Description is used to summarize the content of the web page. It helps the visitors to know about the page before visiting it. Meta Description could be important for the ranking factor of your website but on the other side, it is important for the convenience of your user. The user is searching for some content or the product but you haven’t mentioned it in your title, you may add it to your Meta description and remember it will be noticed by the search engine. Your Meta Description is important for attaining the trust of your users. Therefore ignorance the importance of Meta Description is not a good SEO technique. If you are using the duplicate content for your website, be aware that the duplicate or plagiarism content is considered as a sin according to the search engine. If you are seeking for the better user review or good search results for your website you must avoid the duplicate website even for your own same site. Everything is going great but you haven't paid attention for the mobile friendliness of your website it could be a great cause that your website is not getting the good ranking in search engine. Mobile friendly websites could grab the good attention of the user and attain have traffic for your business. You are able to hit the potential smartphone audience because today’s use is not comfortable with only desktop websites and thinks that business is not taking proper care of their requirements. So make it sure that you have given attention to the mobile friendliness of your website and hitting the right audience for your business. 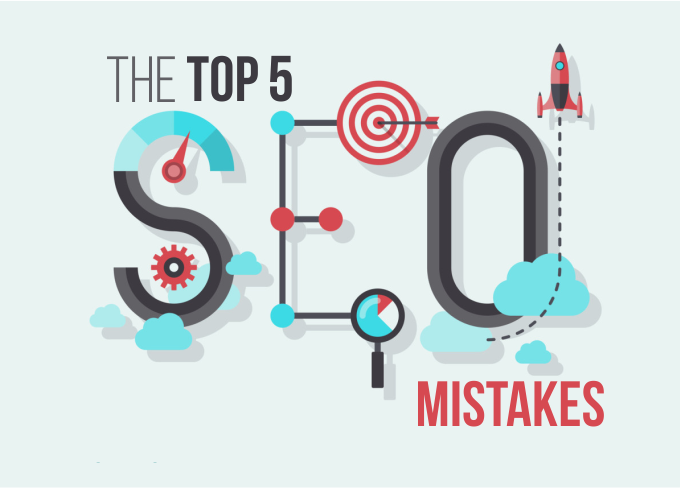 These are the top 5 mistakes that should be avoided by the SEO experts to attain high traffic of right audience for their business as well as the high ranking to all search engine. If you are taking care to avoid all such mistakes it means you are in the correct direction to achieve the goals of your business.